I don’t make Mexican food very often so I had a Fiesta Night for dinner one night a week or two ago because I wanted to try a couple recipes I had modified from Rick Bayless’ show. I didn’t bother looking it up online or anything, just sort of jotted down a couple of the ingredients and the process then added my own elements to it. The results were quite tasty and I was very excited that I didn’t screw it up. 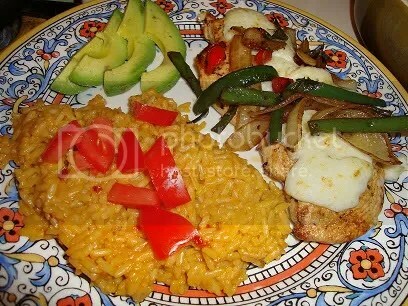 The Menu: Chili-lime chicken cutlets topped with fajita onions and peppers, roasted poblano, and cotija cheese served with Spanish saffron rice and sliced avocado. Seasoned the chicken cutlets with salt, pepper, cayenne, lime juice, and pan seared them in a hot, oven-proof skillet with garlic and olive oil. Once browned on each side, I finished it off in a 325 degree oven to keep it moist. Roasted poblano pepper until slightly blistered, then tossed into a skillet with onions, garlic, olive oil, and red peppers until the onions had slightly caramelized. Brought the stock and water to a boil then added all the ingredients in all at once and lowered to a simmer for 45 minutes until tender. Topped chicken with Cotija cheese and onion-pepper mixture then placed under the broiler for a minute until cheese browned and peppers were heated through. So easy! Minimal clean-up, and very happy bellies. Usually I don’t learn article on blogs, however I wish to say that this write-up very forced me to take a look at and do it! Your writing taste has been amazed me. Thank you, quite nice article.